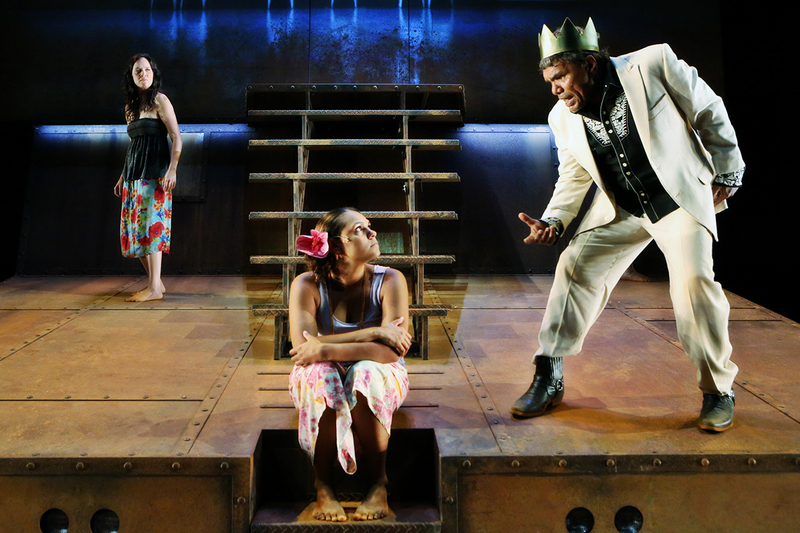 Returning to my review of The Shadow King upon hearing of the death of Tom E Lewis at 59 years of age on 10 May triggered vivid memories of the actor’s bracing account of Lear in this production at the 2014 Sydney Festival. 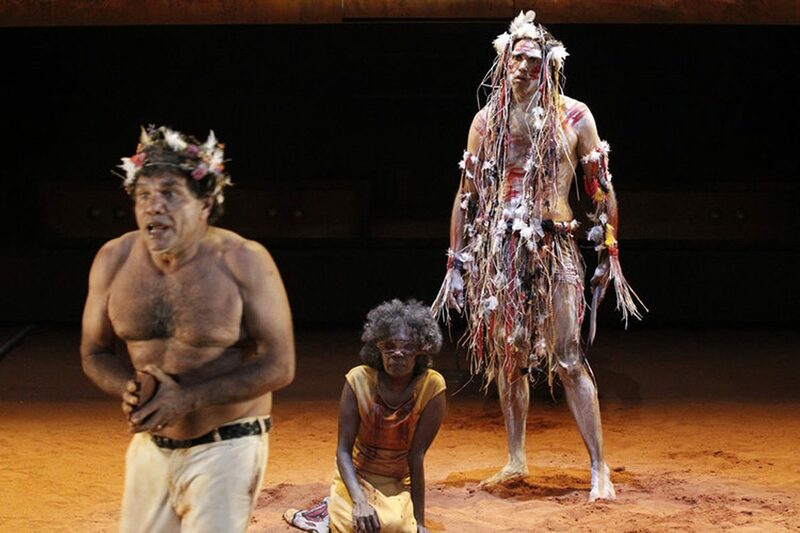 Lewis co-created the production with then Malthouse Artistic Director Michael Kantor in English, Aboriginal languages and creoles, subtly varying Shakespeare’s plot to reflect tensions within an Aboriginal community in northern Australia internally conflicted over country and mineral wealth. Lewis and Kantor speak about the production here alongside brief excerpts from a performance. Lewis had also played Othello in a 2006 Darwin Theatre Company production. I recalled too Lewis’ impressive film debut in the culturally challenging lead role in Fred Schepisi’s The Chant of Jimmie Blacksmith (1978) and his subsequent appearances in the miniseries A Town Like Alice (1981) and We of the Never Never (1985), and in the films The Proposition (2005) and Goldstone (2016), the latter directed by Indigenous filmmaker Ivan Sen.
Sen’s Yellow Fella (2005) incisively documented Lewis’ painful search for the grave of his white Welsh father who separated from the actor’s mother Angelina when his son was a baby. Angelina, a traditional Nunggubuyu woman of southern Arnhem Land, appears in the film, along with 16mm footage of the 1950s Roper River mission in Ngukurr in south-east Arnhem Land where Lewis grew up. Sen’s cinematography dances between intense close-ups and the wide landscapes of Lewis’ country. A brief but representative excerpt from the film can be seen on YouTube. Tom E Lewis was also a richly expressive singer and songwriter as heard on his solo albums Sunshine After Rain (2005) and Beneath the Sun (2013). Both were produced by Darwin-based Skinnyfish Music, so integral to the creative life of Geoffrey Gurrumul Yunupingu (the must-see documentary Gurrumul by Paul Damien Williams is another example of culturally empathetic filmmaking). As Artistic Director, Lewis also played a key role in establishing the Djilpin Arts Cultural Foundation an hour south of Katherine for Beswick and Arnhem Land communities. In 2006 he was presented with the Australia Council’s Red Ochre Award for lifetime achievement in Indigenous arts. For over 40 years in diverse ways, Tom E Lewis significantly enriched the lives of many Australians with his art. Ours is a great loss, lightened a little by film, CD and recollection of a vivid stage presence. The family of Tom E Lewis (Balang T Lewis to his community) have granted the media permission for the use of images and the voice of the artist.